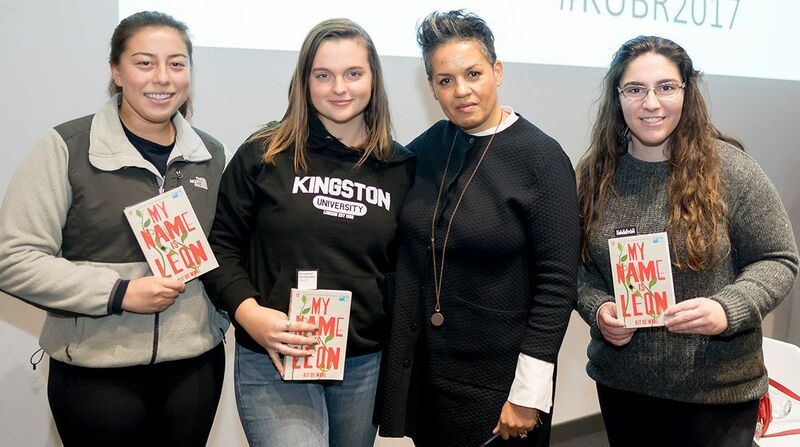 Big Read author Kit de Waal met student fans Chloe Herrera (far left), Julia Harder (left) and Erin Langan (right) at the event. 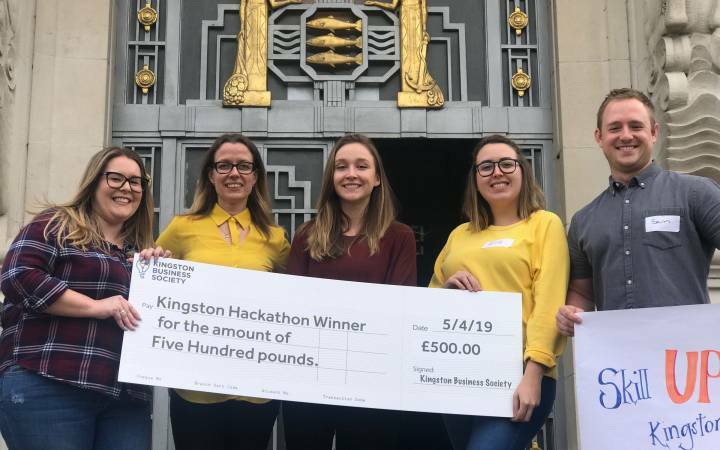 The challenging role of a foster parent and the traumatic decisions made by social workers and adoption agencies were just a couple of the topics touched upon at two recent Kingston University events. At the Audience with Kit de Waal sessions the author answered questions about this year's Big Read novel, My Name is Leon, posed by eager students, staff and fans from the local community. Set in south London in the 1980s, the book follows nine-year-old Leon on his bumpy journey navigating the care system alongside baby brother Jake. The question and answer sessions were run on two University sites - Penrhyn Road and St George's, University of London in Tooting. Associate Professor Dr Alison Baverstock, who heads up the Big Read project and also jointly set up the MA Publishing at the University, hosted both events pulling together some key themes in conversation with the writer before opening up the floor to questions. Dr Baverstock kicked off by asking de Waal if the book had drawn on her 15 years' experience in family law, acting as a magistrate, sitting on adoption panels, working as a social services adviser and adopting two children. "I wrote this book from the heart about the people and life I recognise," she explained. "Leon is not a real child but he's an amalgam of lots of different children that I have come in to contact with over the years." 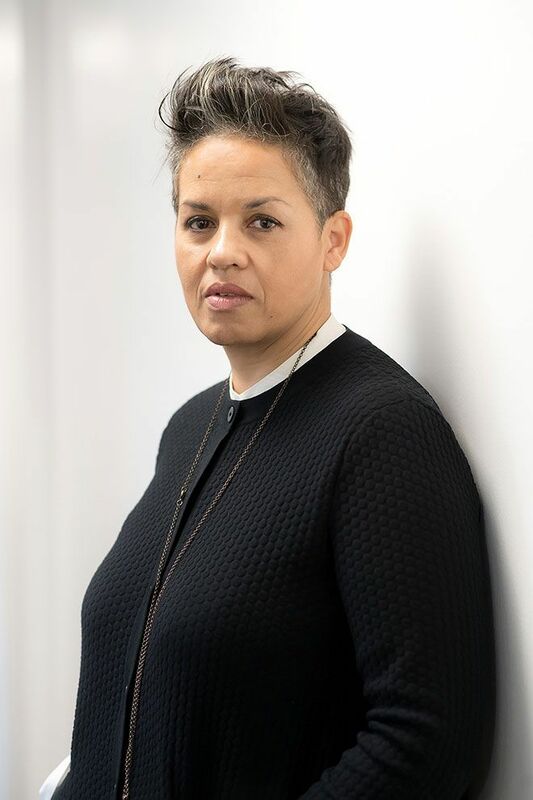 Author Kit de Waal drew on more than 15 years' experience in family law when writing My Name is Leon.She was asked whether the dilemmas that faced those responsible for children in care mirrored those portrayed in the book. "If you're on a panel and you're overseeing 200 families who want to adopt, probably 150 of them will want a healthy white baby like Jake," she acknowledged. "Sadly though, there are very few people who are interested in a stroppy, nine-year-old boy who steals and wets himself – which is heart-breaking because they don't see the amazing child below the hurt." De Waal requested a show of hands from the audience on who would keep the brothers together and who would separate them, allowing Jake to be adopted. Many people did not raise their hands. "When you're on an adoption panel, there is no abstaining," she told them. "It's horrible and ugly – if they stay together, they can support one another but Jake will never have a home and they will both be in care until they're 18. Alternatively, Jake can have a loving, stable family life but will probably never see his brother again." She said she placed Leon in the 1980s as she had very clear memories of living in London during this period and because it was the pre Xbox era. "If I had set it in 2017 Leon would have been permanently on a PlayStation," she explained. Her research for the novel had mainly focused on sweets available in the 1980s – with Leon's favourite being Curly Wurly bars – but she had also used one unusual method of gaining a new perspective. "I was acutely conscious that the story had to be from Leon's point of view so I wanted to see, hear and smell everything as he did," she said. "For Leon, all the decisions about him were made above him from a 5ft plus adult height so I crouched down to a child's level in a supermarket so that I could crawl around the aisles and see how different the world was for Leon at 4ft." The audiences at both events were keen to hear more about de Waal's inspiration for the novel, including for the rucksack Leon carries round with him. "I think it represents the one I had when I started university. I left school at 15 and only decided to go to college when I was 51 so I didn't know anything about higher education and thought it was going to be a mixture of Brideshead Revisited and Hogwarts," she said. "The rucksack I took with me on my first day, stuffed with non-essential items, was a security blanket at a time when I hadn't known the rules and didn't quite feel I belonged." Dr Baverstock suggested that the novel had served a similar function for new Kingston University students who had all been sent a copy ahead of starting their studies. "This ties in neatly with research in the field of child psychology which has shown the benefit of allowing children to bring a ‘transitional object' from home to help them settle in more quickly," she said. 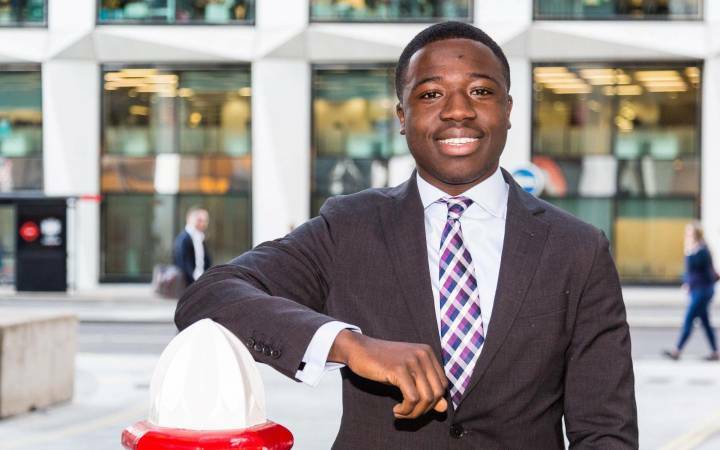 "My Name is Leon has been the same for our students – after receiving their copies, many quickly went on social media saying it had made them feel welcomed and less nervous." When queried on what happened to Leon and whether he would ever see Jake again, de Waal said the audience would have to wait for the sequel to hit the bookstands as it would feature Leon at the age of 44. "His story is also going to be televised in the future," she confirmed. "Actor and comedian Lenny Henry – who read the audio book version – has bought the film rights. He wants to act in it himself as Tufty - Leon's grown-up friend at the allotment." Local resident Brigid Wood said she'd attended the Penrhyn Road session after reading My Name is Leon at her book club. 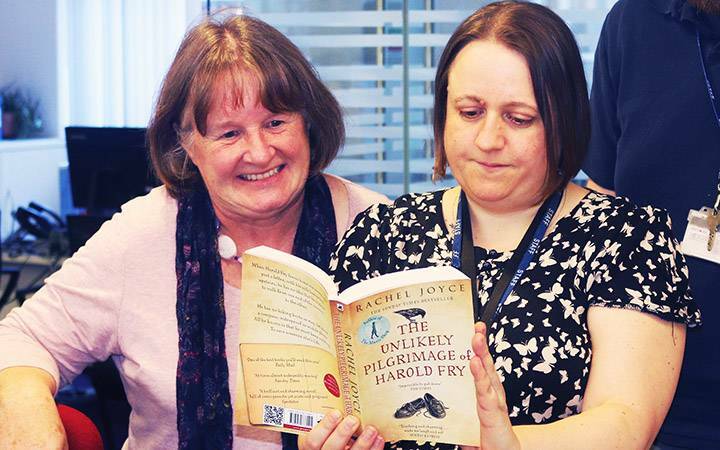 "I've spent many years working with hard to reach children, some a bit like Leon, and this book rang really true to life, so it was a powerful read," she said. "Our club received copies free as part of the Big Read initiative which I think is an excellent way to bring the community and University together. 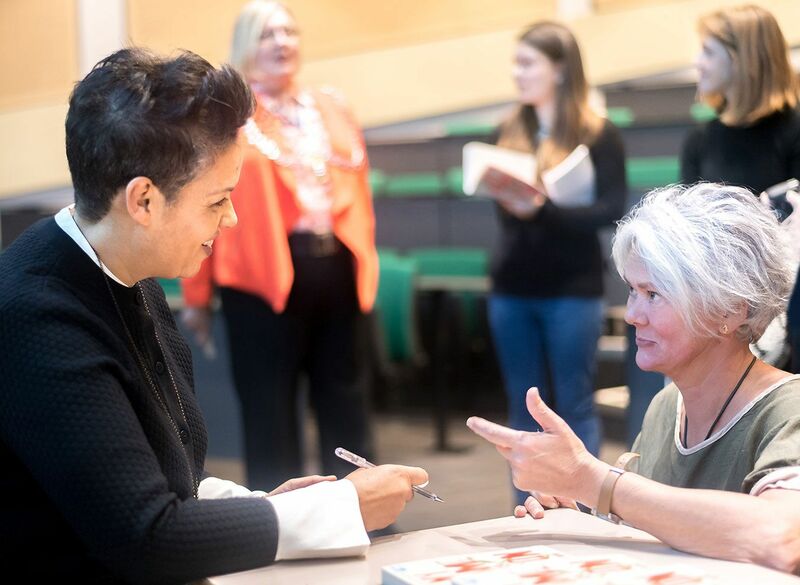 Kit de Waal stayed back to chat to delighted fans and sign copies of the book. 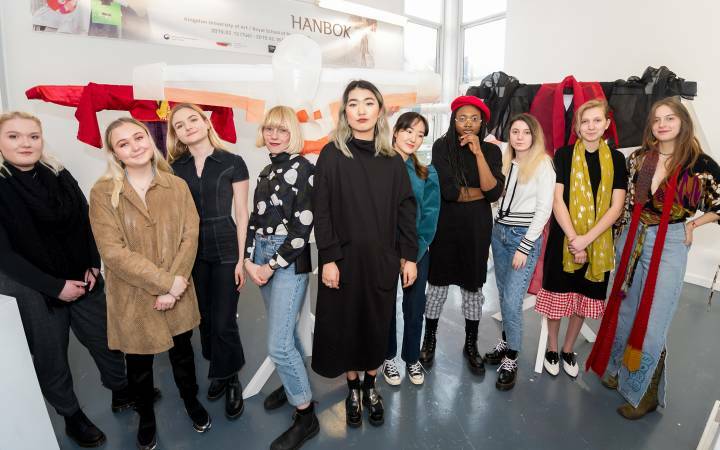 The events were followed by a balloon debate which saw individuals from the University and wider community discuss how key themes in the novel such as self-identity, ethnicity, adoption and deprivation related to their working and personal lives. Local resident and book club member Brigid Wood chatted to Kit de Waal as the author signed her copy of the novel.